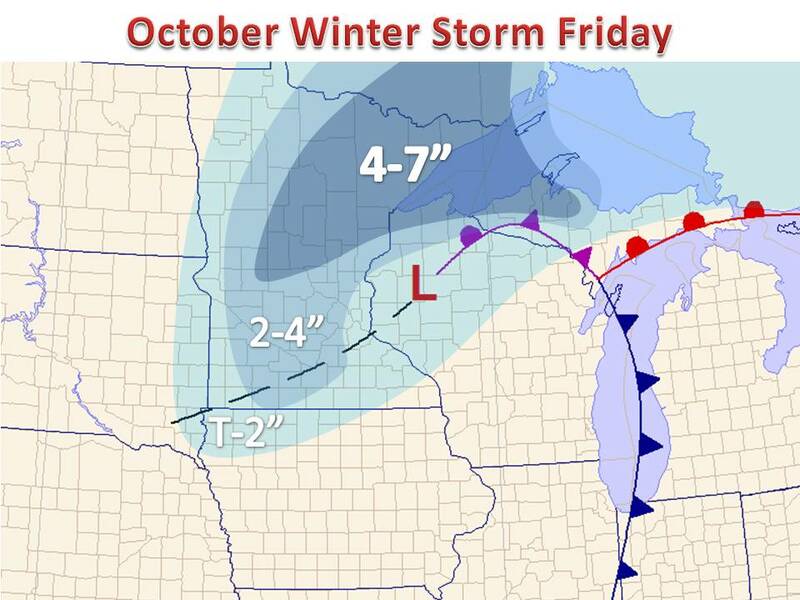 After temperatures reached the 70s and 80s for many across the Upper Midwest last Friday, the first snowfall of the year is starting to take shape tonight. Winter is definitely showing itself much earlier than recent seasons, with largely warm October/Novembers the past several years. A strong clipper system will slide south from Canada tonight, bringing just enough cold air to support snow across much of Minnesota and the Upper Peninsula of Michigan. Most of the snow will pile up west of I-35, with a few inches are expected. Snow will still fall in parts further east, but will struggle to accumulate, with temperature above freezing and ground temperatures in the lower 50s. Below is one model's rendition of how this system may pan out over the next 48 hours. Notice the heavier band work through the Minneapolis metro during the afternoon on Friday, some moderate to briefly heavy snow is possible for a period. Welcome to the start of winter! Look for this blog to become more active over the next 4-6 months. There are some hints of a larger system during the second week of November, so stay tuned to Midwest Weather on Facebook and on Twitter for continued updates.